Heyyy my beauties! Happy Sunday. I thought it was about time for a little beauty chat and to share some favourite from my current routine. When I first started out my blog in 2012, I was a true beauty blogger! When it came to new releases I was there ready to try and review for you all. Now, I tend to stick to more of what I know works for me, which makes me sound old and boring I know. However, my skin has got a lot more temperental over the past few years so I'm a little more selective these days on what products I try! I pretty much always use a primer and really believe in creating a good base for your make-up application. I'm currently trying out the cult Smashbox Photo Finish Smooth & Blur primer, which I have never tried before! I decided to pick it up whilst shopping in duty free a few weeks back and so far I like it, and can definitely see the blur effect once I've applied it to my skin. I've currently got two foundations on the go (ooh dirty) but I genuinely really like them both. The Dior Forever Undercover foundation is one of the lightest full coverage foundations that I have ever used. It is an absolute dream to work with and has become a staple in covering up recent skin issues! More recently, I have been trying the NARS Radiant Longwear foundation which again I really like. I've always loved NARS and their foundations and so far this one is living up to expectations, I love that it gives you a gorgeous glow, but also has impressive longevity. I've always used high end concealers, but seriously I have been converted to the Maybelline Anti-Age Eraser concealer. It is just incredible and probably the nicest concealer formula that I have ever tried. It's hydrating, but does an amazing job of covering up pesky dark circles, there really isn't anything to fault about this product. I do also love to attempt winged eyeliner and when I say attempt, I mean it! I pretty much never get it right on both sides, but the Collection Extreme 24hour Felt Tip Liner has been in my beauty bag as long as I can remember. It's really easy to use and the formula is also really nice, plus it's an absolute bargain. Next up is my current mascara the Benefit They're Real mascara! I decided to pick this back up after not using it for years! I'm a little on the fence with this one, as I'm not sure I still like it as much as I used to. However, there is no denying it's a classic and I'm definitely going to use it up. When it comes to powder products, I'm back on with NARS Laguna! I haven't used it for years as I was converted to Charlotte Tilbury, but I'm enjoying the change back to this cult classic. I'm also using up my Becca Sunchaser Palette, which is an absolute beauty! Everything I have tried from Becca so far has been such amazing quality and the Sunchaser palette is no different. 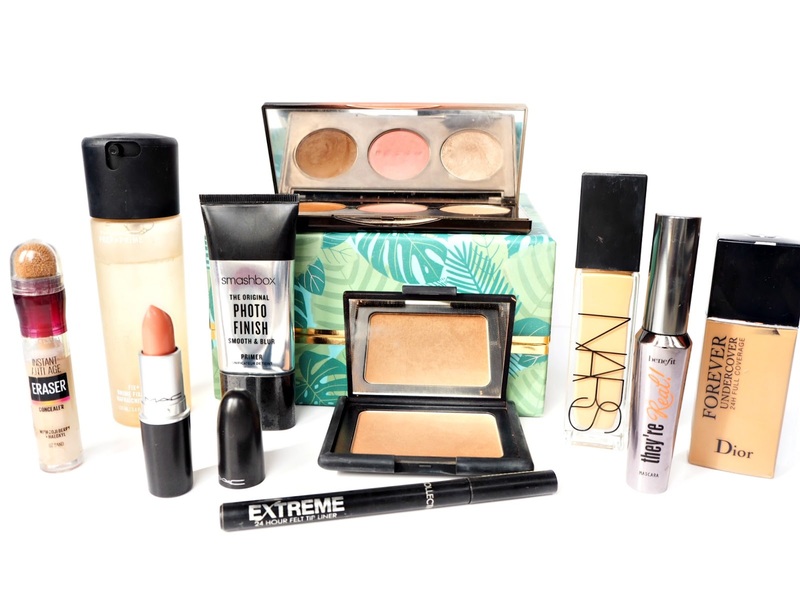 I love to have a blush, bronzer and highlighter all in one place, as it's super handy for on the go. Last but not least I'm using the MAC Fix+ with the Coconut scent, which is a new addition to my collection, but I'm in love. I'm currently fighting off a serious case of holiday blues and I can't believe how long it has been since I've posted on here! 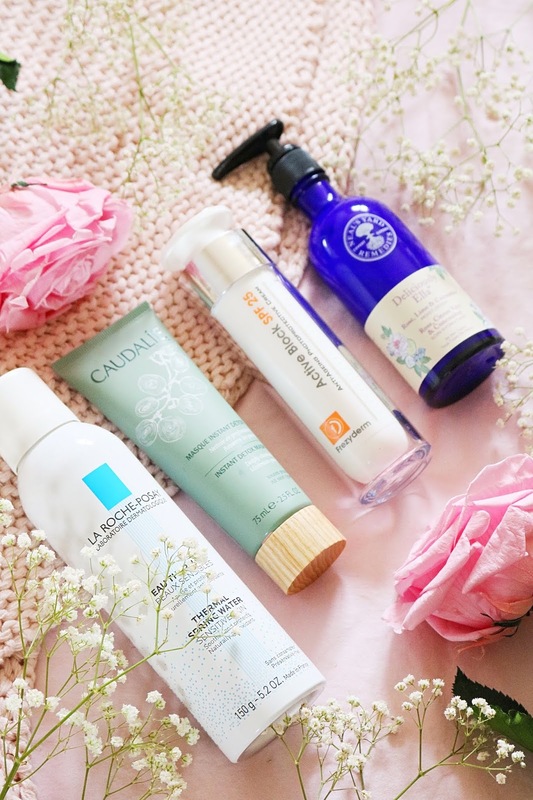 Even though I'm far more active on Twitter and Instagram these days, I still like to sit down now and then and write (Just like the good ol' blogging days) Skincare is one of my favourite things to talk about, so here are a few of my current favourite products that are all suitable for all skin types! I have always loved using Origins skincare, as my skin seems to drink it up like no tomorrow! However, a real stand out product for me is the Origins Ginzing Tinted Moisturiser, which comes from what I think is their most popular range. I have used the Origins Ginzing Tinted Moisturiser for two years now and it’s an absolute godsend, especially when I visit Dubai. The reason I love this so much is because it feels like someone has put a light on my face, it brightens and revitalises the complexion, whilst providing important SPF protection. The coverage is very sheer, but the creamy texture blends out to a shade that perfectly matches and perfects your skin. This product needs no real introduction apart from believe the hype! It’s pure pink loveliness and a cleanser that single handedly sorts my skin out when it’s having a bit of a mare. It’s great for a whole range of skin types, plus it’s super easy and fuss free to use. I can use this cleanser without even looking in the mirror and I love how it starts off as a wonderful pink gel that morphs into a luxurious oil and finally ends up as a nourishing milk type texture. I’m on my fourth bottle now and sometimes I swap this out for other cleansers that need using up, but seriously my skin cries for this stuff when I stop using it. I’m sure you can sympathise with me when it comes to random Boots/Superdrug splurges! You need some painkillers or deodorant, but end up coming out with half the store… YAS, that’s me. About two months ago I stumbled across Garnier whilst on one of my missions and noticed that they had released some new skincare ranges. As far as drugstore skincare goes, I do get along with Garnier quite well! 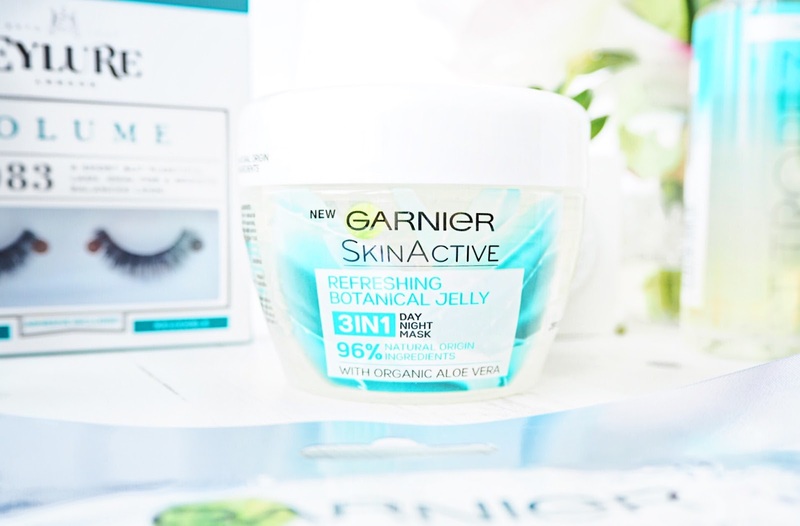 The Garnier Aloe 3-in-1 is a great multiuse product that can be used as your am/pm moisturiser as well as a mask. All you need to do is use more or less depending on what kind of treatment you want. At first it took me a little while to get used to the perfume scent, but now I’m totally over it and totally loving this product. I use it as my daily moisturiser, as it’s so hydrating and creates a lovely base for my make-up, even Daniel likes it and that’s saying something! It reminds me a little of the Clinique Moisture Surge, which is another favourite of mine. The only annoying thing is the size, but on a positive note you do get a lot of product for your money. My god, why haven’t I tried this sooner? I have always really liked Vita Liberata as their products are formulated so well. I have a tanning moisturizer from them, which works better than a lot of my more expensive creams. I’ve heard all about the buzz surrounding Body Blur, but I suppose I just never really needed it until now. I decided to purchase it for my recent vacation to Dubai just to smooth out any unevenness, whilst applying it the first night I thought there is NO way this will survive 40 degree heat and crazy levels of humidity. Guess what? It sure did! I’m actually amazed by this product and can confirm it definitely lives up to the hype. A little goes a long way and it perfects your skin like no other, plus it didn’t transfer in the heat! It’s love. This itty-bitty little travel size has lasted me since my visit to New York in May this year. A little goes a very long way and all I can say is that it is absolutely beautiful, it probably has one of my all time favourite textures and scents. It’s bouncy, pink and smells like an absolute dream. It also works extremely well and really revives my skin, it’s so good I want to eat it half the time. I’m dying to try the daily moisturiser of this product, especially as the ingredients in this are so good for combating redness and pesky blemishes! I haven't been on the blog in a little while and it's a mixture of being super busy at work and working on a new venture, which I really want to make work as it's such a feel good project. Daniel also had a knee operation recently, so I've been on hand to help him get around and making sure he's okay. Today, I wanted to talk about a new find from home bargains, which is a dupe for one of my most favourite products. Anyone that knows me or has read my blog for a while will know that Neom Organics are one of my favourite wellbeing brands. their products are incredible and the quality is about as high as you can get, but of course that means they can be a little pricey. Despite being worth it in my opinion, I have found a dupe that is a lot cheaper and a great way to add a little relaxation to your day without breaking the bank. I buy Westlab Salts a lot for the bath, but I didn't realise they did scrubs and a few other products too. during my recent trip to Home Bargains i stumbled across their Himalayan Salt Scrub with Lemongrass and Mint. I love anything to do with Himalayan Salt and one of my favourite things I own is my salt lamp, which makes my bedroom feel so calm and welcoming. 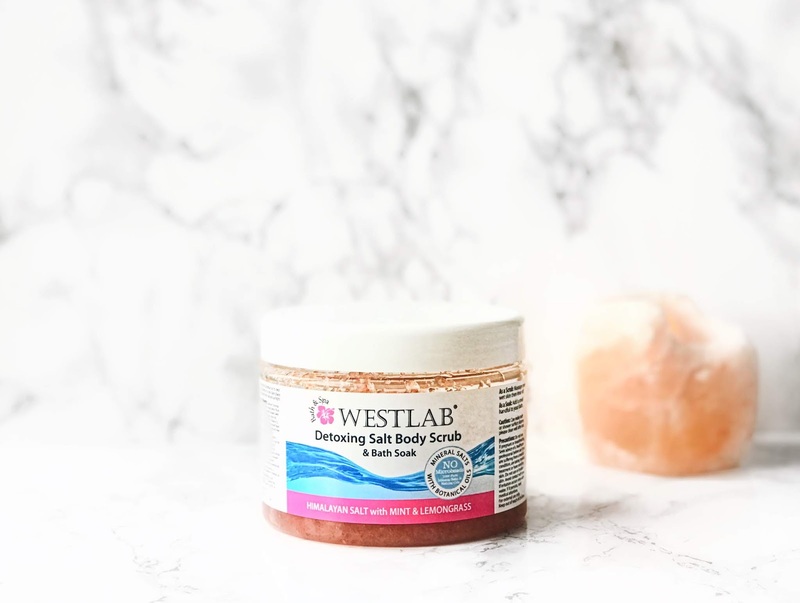 I wasn't expecting to be as wowed by this scrub as I am, it has similarities to the Neom Great Day Scrub as it has a super uplifting scent and feels deeply moisturising from the second it touches your skin. The Neom scrub is sugar based, which is more gentle than the Westlab salt version. However, as long as your skin isn't too sensitive this scrub will make the perfect companion in the shower or as a wonderfully relaxing and rejuvenating bath soak. Overall, I think the Neom Great Day Scrub will take a lot of beating, but I'm glad I've found such an amazing dupe, which can be found for under £5 in Home Bargains compared to the Neom version which is £34. I would love to know if you've tried this product or have another favourite you would recommend? 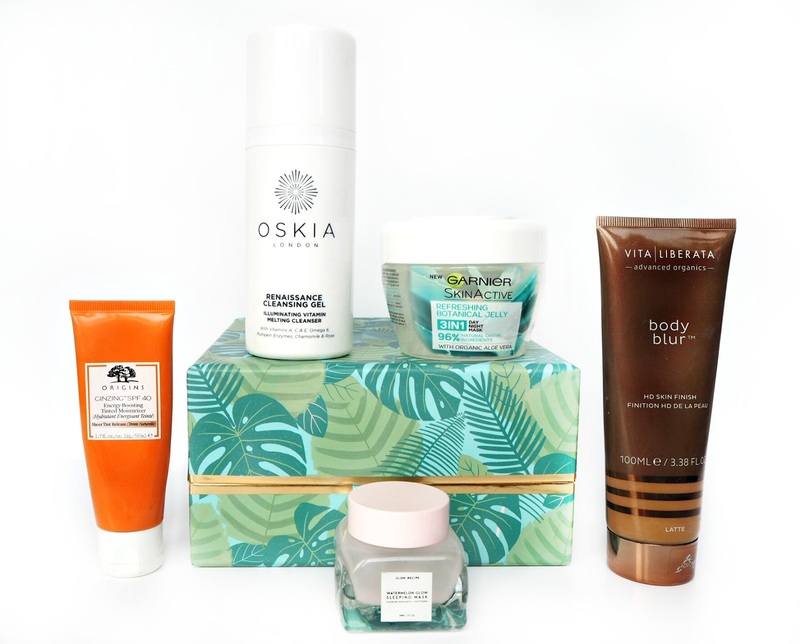 Hi, I'm Heather and today's guest post is all about the skincare I'm loving this spring and that I'll be using throughout the summer months too. My skin is typically very dry and sensitive but during the spring/summer months, it's more normal and a little oily so I need to switch up my skincare for each new season. 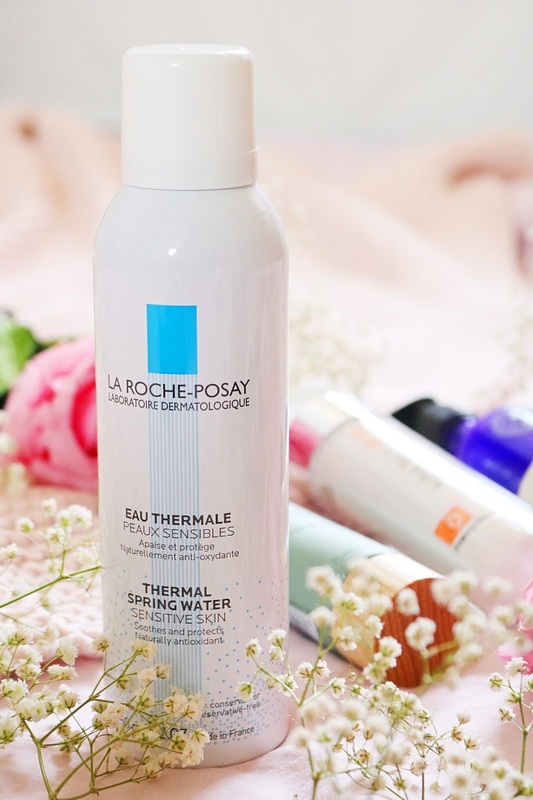 La Roche Posay have a fantastic range of skincare that it ideal for those with sensitive skin, particularly eczema, which is what I sadly have. One of their products that I love especially at this time of the year is their thermale water spray which I use as a instant toner and as a refreshing facial spray during the hotter English spring days. We've had quite a few hot and humid days recently so I've been using this water spray almost everyday - it's so refreshing and cooling! I know that sheet masks are everywhere but I prefer using creamy wash off masks and one of my favourites over the past couple of years is the Caudalie Instant Detox mask which I use on my t-zone when my skin is feeling oily or congested. The mask is pink in colour, it's very effective and dries down on the skin revealing your pores which makes me feel as though it's working well. I'm not the most diligent when it comes to SPF as sometimes it can definitely irritate my skin and living in England, we don't think we need to use SPF as it's typically raining but using sun protection is definitely important. Thankfully I've found a quick, easy and fuss free SPF that doesn't irritate my skin, leave a white cast or have a greasy texture in the Frenzyderm Active Block. It's so easy to use, I love the pump dispenser and it helps to protect my skin from sun damage which is needed especially during the spring and summer months. Lastly, is not only summery in terms of it's packaging but the scent as well! I have been using this lovely moisturiser on and off (along with the equally as gorgeous cleanser) for a while and it always leaves my skin so smooth, moisturised and refreshed. The moisturiser is lightweight but it provides enough hydration for my dry skin without leaving my skin feeling heavy or greasy. It's part of the Neals Yard and Deliciously Ella collaboration and it has the most wonderful, floral and fresh scent so it's perfect for the spring and summer months. My blog has been voted one of the top ten beauty and food blogs in Manchester (2016). If you want to work with me, check out my blog media kit! I literally haven't used Glamglow since they first became massive in the beauty world and despite all of their amazing new releases over the past few years, I just haven't really been that interested. I was in Sephora a few weeks back and on the way to the checkout I saw this sweet mini version of the Glamglow Thirst Mud. I have dehydrated skin so if any Glamglow mask would suit my skin, my bet was that this one would have all the answers. Obviously I picked it up and took it back to the hotel I was staying at in New York and tried it out the following morning. Well, what can I say it was love at first use! I very rarely use skincare products that Daniel (My Fiance) actually notices, so the fact he said wow your skin is looking good made me realise this was the real deal. 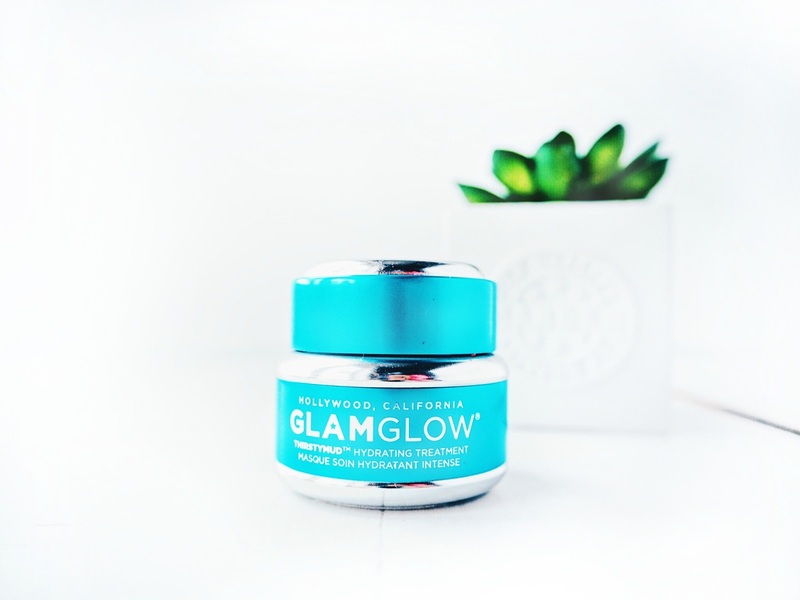 The Glamglow Thirstymud is an intense formulation that works to infuse dry skin with long-lasting moisture. The formula is fortified with innovative Dewdration and HydraPack technologies, which offers the skin a deeply nourishing treatment. Another key ingredient is Hyaluronic Acid that is blended with Raw Honey and Ginger Root to soften the skin and restore hydration and suppleness. Overall, I absolutely adore this face mask and pretty much use it every other day! It's recommended you use 2-3 times a week, but this can also be left on overnight or for just 10 minutes if you're after a quick burst of hydration. My skin is left feeling hydrated, supple and like I've just drank 10 pints of water! I'd definitely recommend this mask if you suffer with dry skin like me! 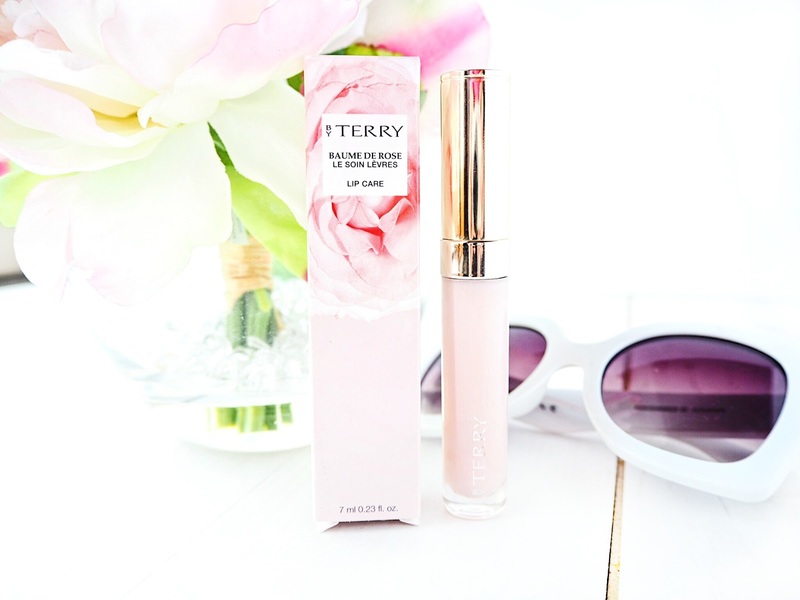 I've wanted to try the By Terry Baume De Rose for the longest time! I'm a sufferer of chapped lips, which never seem to let up. The only balm that has truly helped my lips is the Nuxe Reve De Miel and I have to tell you it's totally amazing and worth trying if you also suffer with dry, chapped lips. I was expecting Baume De Rose to be a similar product but more luxurious. However, it has left me feeling a little unsure on whether it lives up to the hype or not. The must-have Baume de rose is now housed in a more practical, glamorous and travel friendly tube, which is what sold it to me and made it's expensive £32.50 price tag seem a little more justifiable. 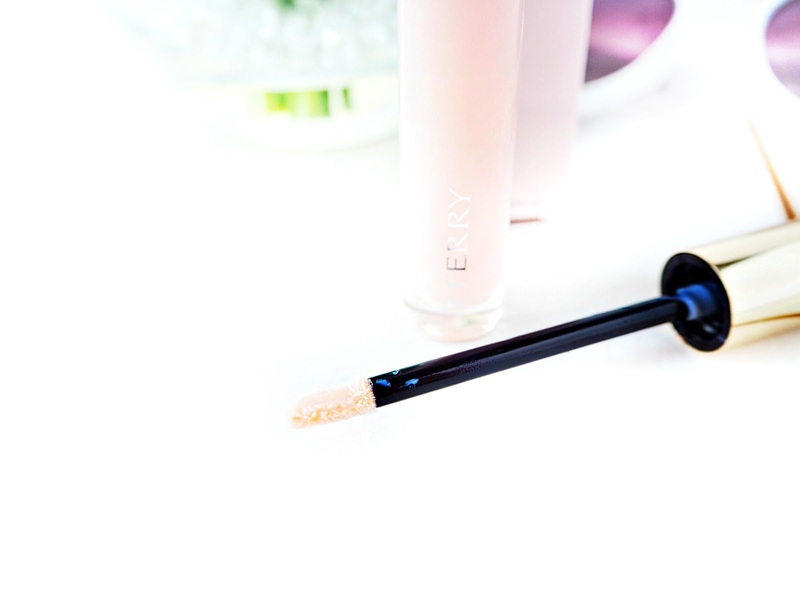 I do love the packaging, it feels very luxurious and looks so pretty, plus the applicator is a dream! Infused with Shea Butter, Rose Flower Essential Wax and Vitamin E, this balm/gloss is perfect for softening and moisturising lips on the go. So what is my problem with it? First of all, I always knew it was going to be rose scented (hint in the name) but I wasn't expecting it to be so potent and more of an old fashioned rose scent, which makes me think along the lines of talc! I use so many rose products daily and none of them have that musky scent, but instead are light and fresh. I also don't find this as moisturising as the Nuxe version, which retails at £10 and makes me think seriously about whether or not the Baume De Rose is worth its hefty price tag. Even though I'm not totally sold, it is a nice handbag essential and of course it does add moisture and a lovely rosy tint, but I think this is more suitable for topping up the hydration in your lips opposed to using it as an actual treatment to tackle chapped lips. I will definitely get use out of this lip balm/gloss hybrid and I'm sure it will feature in many social media posts, it looks so good on camera! I just can't wholeheartedly recommend something which is so expensive, but not as effective as much cheaper options. Have you tried this lip balm before lovelies? Hello lovelies. Hope you've all had a lovely day? Today has been a reflective day for me and to be honest I have had a bunch of mixed emotions, do you ever have days like that where you just can't work out how you feel about everything? That's why I love a Sunday, because whether it's good or bad it's the best day to reflect, as well as giving you the opportunity to start a fresh. On a more positive note, I visited my sister and her family this morning which was lovely! My niece is my absolute favourite, she's such a cheeky monkey but also has the biggest and kindest heart. I love to see her happy and today she was splashing around in the hot tub showing us her swimming skills that she has been learning at her lessons. My sister recently went to a Yoga retreat at The Gainsborough Hotel in Bath and bought back a goodie bag with some gorgeous skincare treats, she knows how much I love my skincare and kindly let me take these home to try out for myself. ama.la are a new brand to me and I've been busy researching their products and their story this afternoon. Amala are a German based premier proven-effective skincare line who create products that come from a 100% natural origin. ama.la certainly do not cut coners when it comes to the purity and potency of the ingredients used, which allows them to create skincare that effortlessly syncs with the skins natural cycle. They are also exclusively featured in five-star spa's around the world and right from the get go you get a naturally luxurious feel from the brand. The story of the amala is amazing and one that I found really inspiring to read, so make sure you check it out if you're interested in learning more about their ethos and potentially trying their products for yourself. The three products that I have tried are all from the Rejuvenate collection and include the rejuvenating serum, collagen mask and eye-cream. Even though it's too early to say how these products have worked for me, my initial thoughts on the brand are really good. 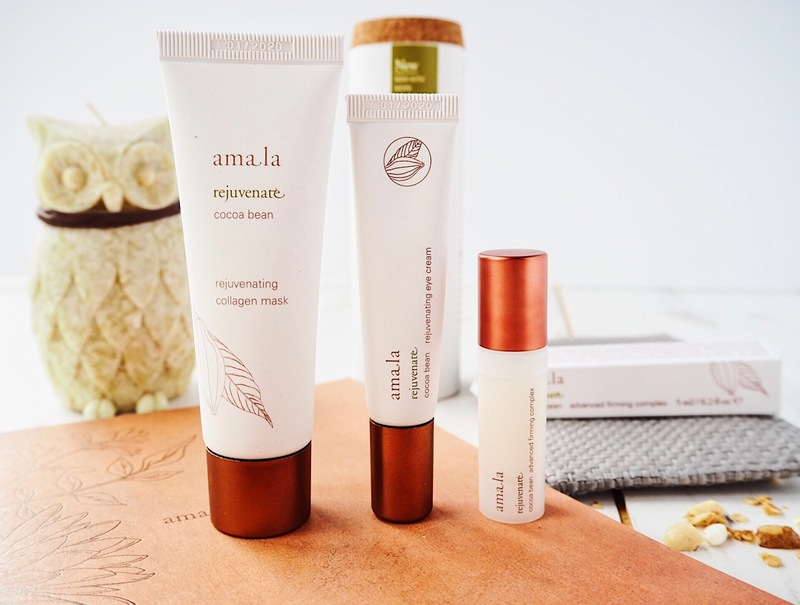 The branding and packaging is effortlessly luxurious and from what I've researched ama.la seem to have their priorities in the right place when it comes to creating effective natural skincare. It will take a good couple of weeks to see how the serum and eye-cream perform, but as Masks are generally designed to give immediate results. so I thought I'd let you know how I got on with it. The amala rejuvenating collagen mask uses key ingredient Cocoa Bean that is used across the entire Rejuvenate line. It is known for its abiity to stimulate cell renewal, promote better circulation and help repair the skin's moisture barrier. Green Algae helps to promote collage production, while moisturising and smoothing fine dtry lines. Buriti is another power house ingredient that increases elasticity and protect skin with an array of antioxidants. After one use, I found my skin to be immediately smoother, pores were visibly smaller and my skin had a radiance it has lacked since getting back from a city break to New York last week. Overall, I'm really interested to learn more about this brand and they have a whole range of products for different skincare concerns, so I think there might be something more suitable for me out there! The Rejuvenate range is perfect if you're looking to firm, nourish and renew your skin. Have you discovered any new brands beauty/skincare brands recently? Hey Beauties! Hope you're all enjoying the much welcomed sunshine we're having at the moment. It's so nice to finally get outside and enjoy the gentle breeze and warmer weather! I'm all about that BBQ life and have had two already, I'm totally obsessed with alfresco dining and love how much happier it makes me feel. Earlier today I popped to town and ended up picking up a random selection of goodies from Superdrug, so I thought I'd share them with you on the blog. I'm also loving how easy it is to get blog content with the Olympus Pen, my poor 700D hasn't had a look in the past few months. So a quick update! Last week I posted about the Garnier Soothing Tissue Mask, which was really lovely. However, Monday night after work I picked up the same mask but in the De-tiring formula and I'm absolutely smitten, after two uses during the week my skin has calmed right down and has been in its best condition in a while. I had to pick up another two and I can't wait to use one tomorrow as part of my Sunday Slumber pamper routine. After putting out a Twitter poll first thing this morning, it was decided by you lovelies that I should try Bondi Sands over my usual favourite Vita Liberata. I've just applied one coat and even though it's too early to review it properly, it does smell absolutely amazing. After picking up my first ever bottle of Bondi Sands Dark Tan, I decided to get myself a new Mitt, I mean why not?! The MineTan mitt really caught my eye with it's bright packaging and foam/velvet feel. I've already used this as I was desperate for a touch of bronze and I actually really liked it. On first use it seemed to spread the tan out more effortlessly and evenly, despite sounding a little like a squeeky window cleaner! Do I need another cleanser? The honest answer is absolutely not, but all my cleansers are quite chunky and not exactly travel friendly. With my trip to New York less than a week away, I wanted to get something that was travel friendly, easy to use and nourishing. I stumbled across the New Garner Honey Gel, which is 96% natural and contains Honey Flower, known for its nourishing properties. 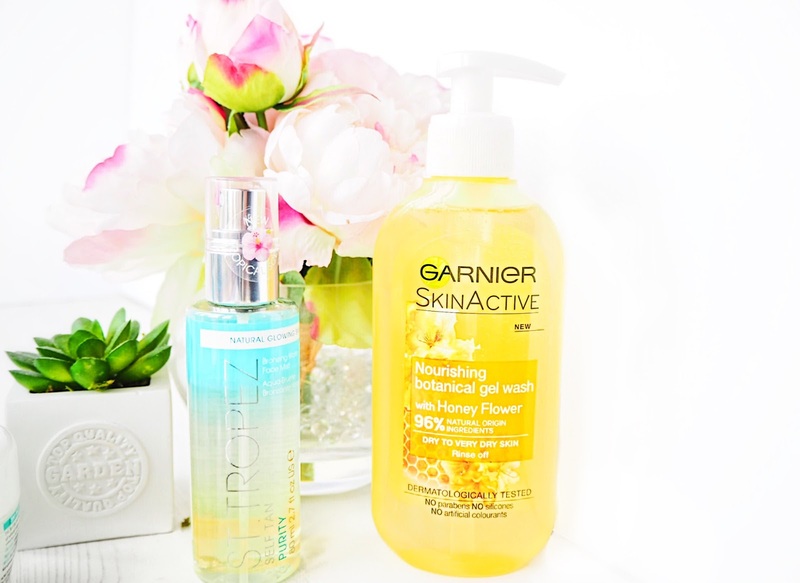 When it comes to drugstore skincare, I really seem to get along with Garnier and I love multi-tasking products! I picked up the Aloe Water Jelly partially because I was curious and partially because I wanted the super cute free cup that came with any three purchases! My skin can get seriously dehydrated, especially after long haul flights, so I'm hoping this 3 in 1 product will help to give my skin a much needed boost of hydration. I picked this up on a total whim and quite an expensive one at that! I'm obsessed with face sprays whether they tan, or simply hydrate. I love to keep a subtle glow on my face and apparently after one use there is a noticeable difference, plus it stays put for a few days, it's sounding real good! I'm not sure how I'm going to get along with this, so will be definitely updating my blog with my thoughts on this one once I've trailed it out properly. I wear false lashes every single day, which I know might sound crazy for some but I find it so much easier to pop them on than taking ages trying to get my desired look with mascara. My lashes are quite short, so I find that false eyelashes really good for brightening up my eye area. 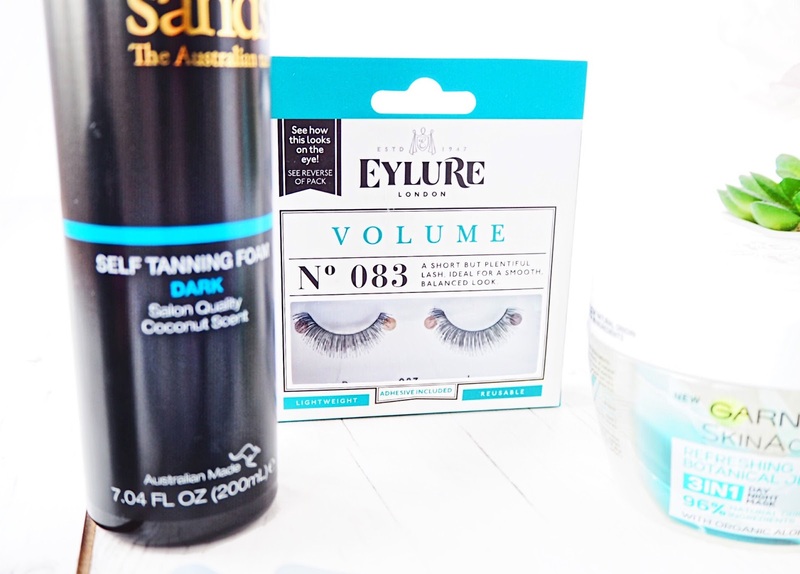 I always go for the Eylure Volume range! I feel like I'm totally missing out on this brand, I need to try more of their products that are constantly getting raved about. I picked up this priming base water, which I'm hoping will be a good setting/priming spray until I get a chance to stock up on my beloved Urban Decay All Nighter! 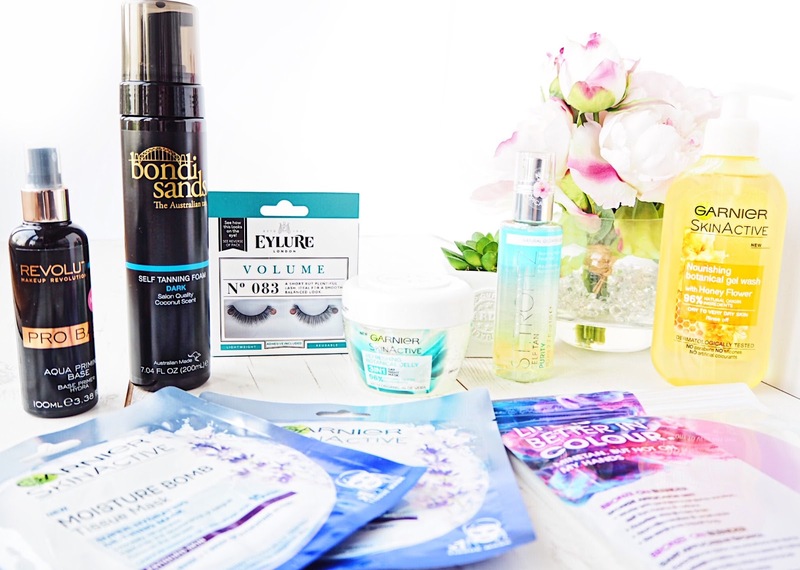 So it's safe to say I'm well stocked up on hydrating and tanning goodies, what have you splurged on recently?